Definition at line 41 of file llvoground.h. Definition at line 54 of file llvoground.cpp. Definition at line 47 of file llvoground.cpp. 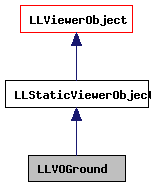 Definition at line 78 of file llvoground.cpp. 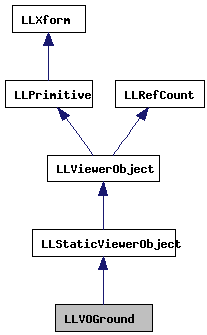 References LLPipeline::allocDrawable(), FALSE, LLPipeline::getPool(), gPipeline, LLViewerObject::mDrawable, NULL, LLDrawPool::POOL_GROUND, and LLPipeline::RENDER_TYPE_GROUND. Definition at line 58 of file llvoground.cpp. References gPipeline, LLPipeline::hasRenderType(), LLViewerObject::mDead, LLPipeline::RENDER_TYPE_GROUND, and TRUE. Definition at line 91 of file llvoground.cpp. References LLDrawable::addFace(), f, face, gCamera, LLCoordFrame::getAtAxis(), LLDrawable::getFace(), LLSky::getFogColor(), LLCoordFrame::getLeftAxis(), LLDrawable::getNumFaces(), LLPipeline::getPool(), gPipeline, gSky, LLColor4::mV, LLVector3::mV, LLVector3::normVec(), NULL, LLDrawPool::POOL_GROUND, S32, LLPipeline::sCompiles, TRUE, LLDrawPoolGround::VERTEX_DATA_MASK, and VZ. Definition at line 73 of file llvoground.cpp.